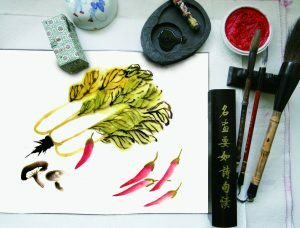 Discover the fascinating art of Chinese brush painting and try your hand at this expressive art form. This workshop is suitable for beginners or people who have painting experience but would like to explore Chinese brush painting techniques. No prior knowledge is necessary, you should simply be keen to learn and willing to hold a brush. All tools and materials used during the workshop will be supplied. Using Chinese soft brushes, ink and colours, you will be shown how to achieve wonderful paintings in the style of Chinese old masters. Participants will have the option to select from a range of subjects demonstrated by the tutor, such as fruit, vegetables, orchids etc. We will complete at least three paintings during the workshop making this a productive and enjoyable day. The workshop will be led by Chi Zhang, experienced art tutor, shortlisted ‘Sky Art Landscape Artist of the year 2015’. His Chinese calligraphy has been projected on Edinburgh Castle during Edinburgh Military Tattoo 2015 and his Chinese landscape painting has been exhibited in Scottish National Gallery Academy Building in 2012 and 2013.